I’ve always liked the look of the headquarters of the Church of Jesus Christ of Latter-day Saints (popularly known as the Mormon Church) in Southeast Asia and Micronesia. The Manila Philippines Temple, located in Brgy. Ugong Norte in Quezon City, has a very nice view since it overlooks the Marikina Valley. It is the second LDS temple in Asia after the Tokyo Japan Temple and the 29th temple overall. This place of worship was constructed starting in 1982 then dedicated in 1984. During the construction, the street it was on was renamed to Temple Drive in its honor. 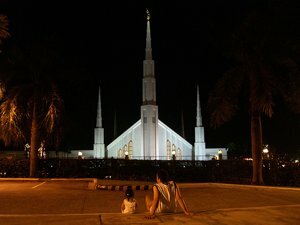 There is currently a second Philippine temple being constructed in Cebu City, hopefully to be finished by the end of this year and to be dedicated in 2010. The temple features the impressive spires characteristic of many LDS temples especially the local sub-temples (?) in the Philippines. The front spire, the tallest of the six in the temple, has a statue of the Angel Moroni on it. The Angel Moroni is believed by Mormon adherents to have visited Joseph Smith, Jr., the founder of the Latter-day Saint Movement. If you’re interested to learn more about the Manila Philippines Temple, you can go visit the official website.